Guess who is in the news (for all the wrong reasons) again? You get three guesses. 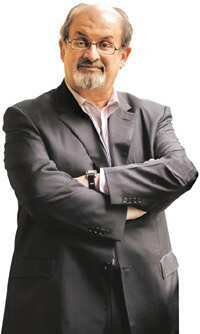 Yes, you are right the very first time: Salman Rushdie! This time, the rumour mill has it that he got an editor of Granta, a high-profile literary magazine, fired for rejecting one of his essays. The accusation has been denied by Granta owner Sigrid Rausing, but the additional fact that the new editor of Granta expressly accepted the Rushdie essay in question is not likely to silence sceptics. Come to think of it, getting a few editors (and publishers) fired might not be so bad after all. The publishing industry in the West has become so market- and publicity-heavy that authors have almost stopped counting. Many big Western publishers and editors believe that they can “make" books and authors out of the blue. They jostle each other like second-rate Bollywood producers to ape the latest masala success, wasting millions on futile mimicry while unwilling to encourage originality and difference with even a few thousands. This has even led to protests by the biggest union of authors and writers in the UK, which has alleged that publishers are passing on the buck for the financial crisis to authors by cutting on literary titles, new works and signing amounts. The top 2% of published authors get 90% of the advances, it is alleged. The others have to make do. Rushdie, comfortably ensconced in the top bracket, can presumably get editors fired. Maybe he should, if he hasn’t yet. But not editors of a serious literary magazine such as Granta, one would hope—there are fatter, uglier, shallower fish in the murky waters of international publishing. If Sir Salman goes trawling for them, I, for one, will stand on the shores and cheer. But then, it is difficult to have the heart to trawl for fish, no matter how slimy, that gape in awe at you. Talking of Rushdie, I find myself sharing space with him in an interesting new anthology edited by Meenakshi Bharat and Sharon Rundle. Fear Factor: Terror Incognito contains a number of stories and some extracts from novels that set out to explore the aura of fear pervading the world today. As Bharat puts it in the introduction, the stories offer “a self-turning critique of fears", ranging from psychological terror to monsters, ghosts and, of course, terrorists. Among the 20 Australian and Indian writers selected, we have David Malouf, Kiran Nagarkar, Thomas Keneally, Gulzar and, of course, Rushdie, among others. Sudeep Sen is an established Indian English poet. But more than that, he is a poet who has devoted much of his time to the rather thankless job of promoting Indian poetry. His latest book provides evidence of it. Aria is, as the subtitle indicates, a collection of “translations by Sudeep Sen" (an excerpt from which features in our Free Verse column). These translations are from various Indian languages, such as Bengali, Urdu and Hindi, that Sen knows, as well as from languages he has read (and translated) in collaboration with the original poet. The latter type of translation flings the net very wide, from Hebrew and Persian to Icelandic and Korean. Taken together, this is a captivating selection of world and Indian poetry, translated by an active poet who evidently cares for poetry and—what is unusual—other poets scribbling away in the wildernesses of prose.